What Does NPK Stand for on a Fertilizer Label? What Do the Letters NPK Mean on a Fertilizer? NPK stands for "nitrogen, phosphorus, and potassium," the three nutrients that compose complete fertilizers. You may encounter these letters when reading the contents printed on bags of fertilizer. 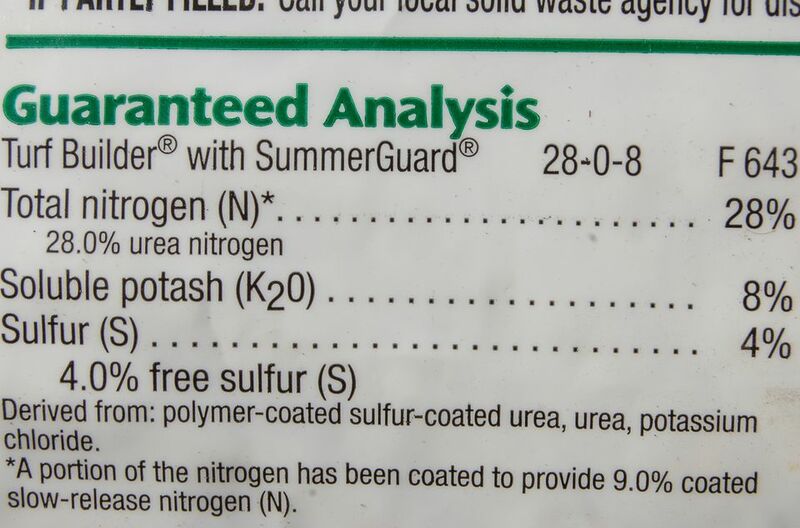 The description of the fertilizer may not expressly say "NPK," but you will at least see a series of three numbers. These numbers correspond, respectively, to the nitrogen content, phosphorus content, and potassium content of that fertilizer. Also implied is a percentage symbol after each number because each of the three numbers represents the percentage of that nutrient in the makeup of the fertilizer. Not all types of plants have the same nutrient requirements, and you can sometimes do more harm than good when applying chemicals haphazardly. Applying a fertilizer high in nitrogen will cause certain plants to put all their energy into producing foliage at the expense of flowers. If you do not have a good grasp on how well your soil is meeting the nutritional needs of a plant but still feel the need to feed it at a particular time, you should try one of the following options. Use compost instead of a chemical fertilizer. Apply a slow-release fertilizer, which is less likely to harm plants to any great degree. To advance this discussion from the academic to the practical, let's take a brief look at the roles that the constituents of NPK play in plant growth. Nitrogen promotes leaf development because of its role in the plants' coloring and chlorophyll. At the opposite end of the spectrum, gardeners sometimes encounter the problem of nitrogen depletion. Yellowing of typically green plants often indicates a nitrogen deficiency. Phosphorus and potassium have some overlapping roles. Phosphorus plays a key role in the growth of roots, blooming, and fruiting, which is why it is an essential nutrient for your plants in spring. Potassium also plays a part in root growth as well as in stem development. To exemplify the balancing act, the product in the picture provided is a Scotts Turf Builder product intended to help your grass in summer. The NPK value is listed as 28-0-8, meaning it contains 28% nitrogen, no phosphorus, and 8% potassium (potash). Why would the company leave phosphorus out in this case? This product used to contain phosphorus, but Scotts explains that they have removed it for environmental reasons. Phosphorus was retained in their Starter fertilizer (designed for spring use) because of its importance for initial root development. Complete fertilizers or balanced fertilizers are so called because of their amounts of nitrogen, phosphorus, and potassium. A fertilizer listed as "10-10-10," for instance, would be a balanced fertilizer because of the equal proportions. One listed as "10-0-10" would not be considered complete, but referred to as an "incomplete fertilizer." An incomplete fertilizer is not necessarily inferior to a complete fertilizer. Identifying the better fertilizer depends on the circumstances. If your soil already had an excess of one of the three nutrients in NPK, you could actually be harming some of your plants by adding more of it to the soil. That is precisely what you would be doing, (inadvertently) by using a complete fertilizer. This is why it is important to have your soil tested. Otherwise, whenever you add anything to your soil, the effect (whether positive or negative) is left to chance. What Is a Nitrogen-Fixing Plant?